Although it is the Monday after Easter here in Japan, it is still Easter Sunday in the States. This means that we are not too late in wishing you a Happy Easter. We hope that you experienced the blessing of God as you celebrated the resurrection of his Son. It has been two months since we have returned to Japan after our time in America, so we would like to update you on a few of the things happening here. Of course, yesterday was our Easter Celebration Service. Many new visitors and a number of old friends joined us for our special service, and a total of nine different nations were represented as we worshipped the risen Lord. The highlight of the day was the testimony of Mr. Cho. 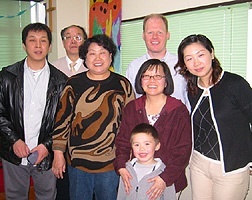 He is a Christian from China who is currently in Japan with his wife visiting his son and daughter (see the picture to the right). As you may remember, the daughter was baptized at SIBC last June. It was great to hear his story about how he came to faith in Christ while growing up in atheist China. What a wonderful reminder of the impact that the resurrection of Christ has had on the nations. It is truly a privilege to be a part of a global family of believers who are united in a common faith. On Monday, March 21st (a national holiday in Japan), we held our third annual Children’s Easter Party. Again, we were greatly encouraged to have so many unchurched people in attendance. Over 60% of the children were from outside of SIBC. Everyone had a great time as we sang, ate, did crafts, heard the Easter story and watched an Easter drama put on by the Sunday School kids from the church. Our desire is that these unchurched children (and their parents) would eventually join us on Sunday morning. Please pray that the Lord would continue to open doors of relationship with these new contacts. It didn’t take us long to get adjusted back to life in Japan. As much as we enjoyed our six months in the States, there is something about Japan that feels like home. 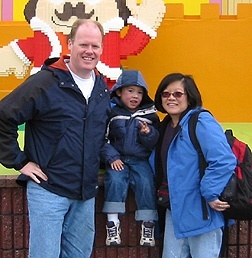 Luke started back at his Japanese preschool in late January. He attends school five days a week, for five hours each day. At first, he was real excited to be back, but after about a week, that excitement wore off. Although he likes the school itself, the difficulty of not being able to communicate in Japanese with the teachers and students has been stressful for him. People always tell us that children adapt easily to new situations, but as parents, it breaks our hearts to see our 4-year-old boy carry around so much anxiety. He finished his first year on March 18th and will start his second year on April 7th (Japanese preschools last three years). We would appreciate your continued prayers for our precious son. The ministry at SIBC has been both challenging and encouraging. Attendance dropped quite a bit while we were away, mostly due to foreigners who have returned to their home countries. Although this is pretty common for an international church, the Lord has yet to bring us new faces to replace those who have left. 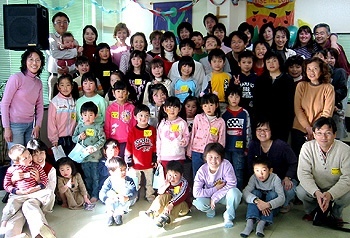 Please pray that we would be able to maintain the delicate balance (60% Japanese / 40% foreigners) that we feel we need in order to be an effective multi-cultural church. Also, things have been a little uncertain among the leadership team since we have returned. During our six months away, the church leaders really stepped up to the plate and took upon themselves the responsibility for the church. For this we are very grateful. At the same time, Chris and I gained new understanding of church leadership and grew as leaders while in America. These two dynamics have resulted in a bit of ambiguity over the roles and responsibilities of the pastors and the leadership team. Please pray for us as we continue to get readjusted to one another after our time away. One of the real encouraging things of the last two months is that there has been a mini prayer awakening in the church. There is a power and passion for prayer at our weekly prayer meetings that we have never seen in the last 6 years. On the one hand, God is stirring our hearts for more of His presence. On the other hand, He is also humbling us and calling us to repentance and complete surrender to Him. We are greatly encouraged that the Spirit of God is moving in this way. Our prayer is that this would spread beyond the Wednesday prayer meeting and begin to impact the church as a whole. 1) Please pray for much spiritual fruit from the Easter Service and Children’s Easter Party. May many people have a growing desire to know our risen Lord. 2) Please pray for unity and clarity of direction for the leadership team. May the Lord lead us according to His will and purpose for SIBC. 3) Please pray for renewed momentum in the church, especially as the Holy Spirit awakens us to prayer. May there be a growing passion for each Christian to become a genuine lover of God. 4) Please pray for peace and blessing upon Luke as he starts school again in early April. May we, as parents, know how to best comfort and support him as he continues to adjust studying in Japanese. Thank you for all of your prayers and support. We appreciate each one of you.